Reclaimed lumber is milled wood that has been recovered from its initial installation for reuse in a new application. To date, reclaimed lumber has been recovered most frequently from buildings such as old barns, factories, and warehouses. Increasingly, old wood is also being recovered from smaller structures such as old houses, boxcars, wood packaging, and ​pallets. Existing lumber constitutes a vast potential reserve for reclaimed wood enthusiasts and entrepreneurs to tap. Greater than 3 trillion board feet of lumber has been milled in the U.S. since 1900. A significant amount of that material is still found in structures. While demolition and landfilling have long been believed to be the cheapest approach to eliminating old buildings, the deconstruction of old buildings is becoming more prevalent. Given the interest of consumers in reclaimed lumber and other salvaged materials, the economic case for deconstruction continues to grow. Reclaimed lumber can be free if you are successful in securing your own source. It will likely involve considerable investment in time and effort, however, along with other cost considerations related to transportation, dry storage, and preparation. Typical preparation includes the removal of old fasteners or other steel, cleaning, etc. Reduces consumption of new timber, and as such results in less disturbance to forest ecosystems. Helps to reduce landfill waste. Reclaimed lumber has a lower carbon footprint than new lumber production. Commercial reclaimed lumber recovery generates more jobs than grinding or landfilling old wood. Reclaimed lumber gains points toward LEED certification in construction projects. Reclaimed wood has an element of romance and nostalgia associated with incorporating “wood with a story." Can often be of better quality than new material. Can fetch higher prices than new material, which can offset the extra costs of reclaimed lumber recovery. Reclaimed wood is typically recovered from building deconstruction projects. Since its development in the 1980s, the reclaimed wood industry typically focused on old barns as a source of material. The quest for old wood subsequently led to an interest in a variety of old commercial and residential structures. One unique approach to salvaging old timber is undertaken by Timeless Timber, Fountain City, Wisconsin. It recovers logs from the depths of the Great Lakes. Throughout the 1800s, the company notes, logging companies transported logs to mills on water. Many of the old growth logs sank, but have been preserved in the low oxygen conditions of icy waters for over a century. In order to secure sources of reclaimed lumber, it will be useful to establish relationships with deconstruction operators, renovators, and others. Processing of reclaimed wood can be costly as typically any fasteners or other metal must be removed by hand. If further milling of reclaimed wood is required, additional metal detection must be undertaken of each piece prior to processing to avoid damage to milling tools. 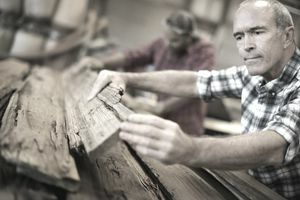 Milling is often required, as reclaimed lumber may be upcycled into a range of products, including flooring, cabinets, furniture, mantels, or beams. Wood pallets are an important source of shorter lengths of reclaimed lumber. One cautionary note is that reclaimed wood must pass an engineering inspection before being reused for structural purposes in construction - a step not necessary when the wood is used strictly for non-structural applications such as furniture or decorative purposes. One benefit of high-quality old-growth timber is that it is seasoned and stable, and so is not subject to twisting or shrinking when reused in a building.